Ever since working in dermatology, I have found a new appreciation for a good skincare routine. I think we all remember the days where we’d fall asleep without taking our makeup off (gasp!) but as we get older, we need to be a little more diligent about our skincare not only to keep it healthy, but also looking young! 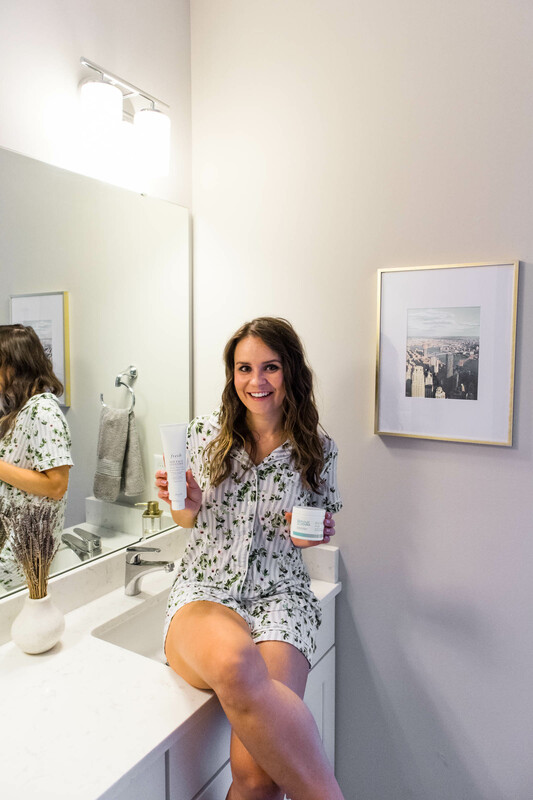 Everyone’s needs are different and it may take time to find products that you truly love, but this nighttime skincare routine has been working for me as of late so why not share it with you guys?! Below I’ll be sharing a few of my current favorite skincare products and the reasons why I use them! The majority of the time I use the Almay oil-free pads to remove my eye makeup or lipstick. They are gentle and don’t burn your eyes (and coming from someone who wears contacts, that’s important!). I’m a huge fan of Fresh products and have been using their Soy Face Cleanser on and off for a few years. It smells ah-mazing, which is why I keep coming back to it, but also does a great job of removing makeup. If you’re looking to save money though, I would spend the least amount on your cleanser since it spends the least amount of time on your skin. I will alternate applying either Retin-A or Gly-Sal pads every other night. Retin-A is a topical form of Vitamin A which aids in skin cell turnover. It is typically prescribed for acne, but also has anti-aging benefits and can help to lighten dark spots/hyperpigmentation over time. If you can only choose one anti-aging product (besides SPF, because that’s still #1) then choose a retinol. And you can purchase over-the-counter retinols which will still give you results, they’re just not as strong as a prescriptions. 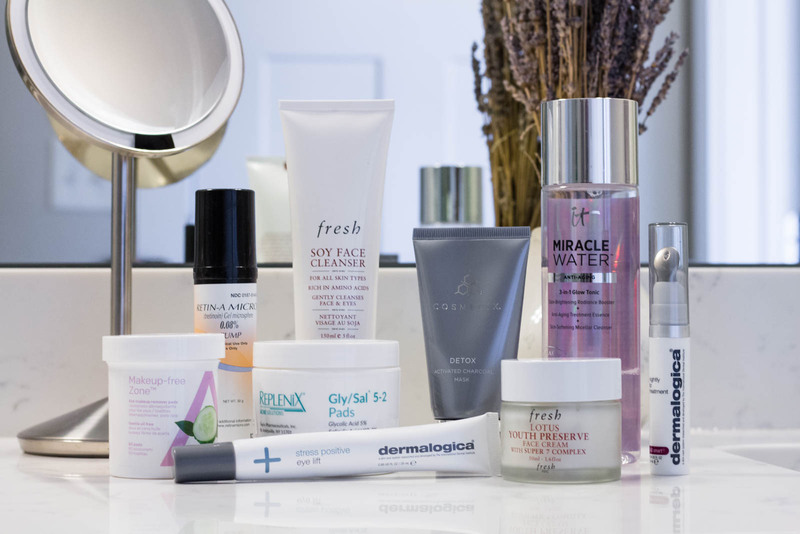 I like to shop at Dermstore because they have a lot of professional-strength products and you can check out their selection of retinol treatments here. 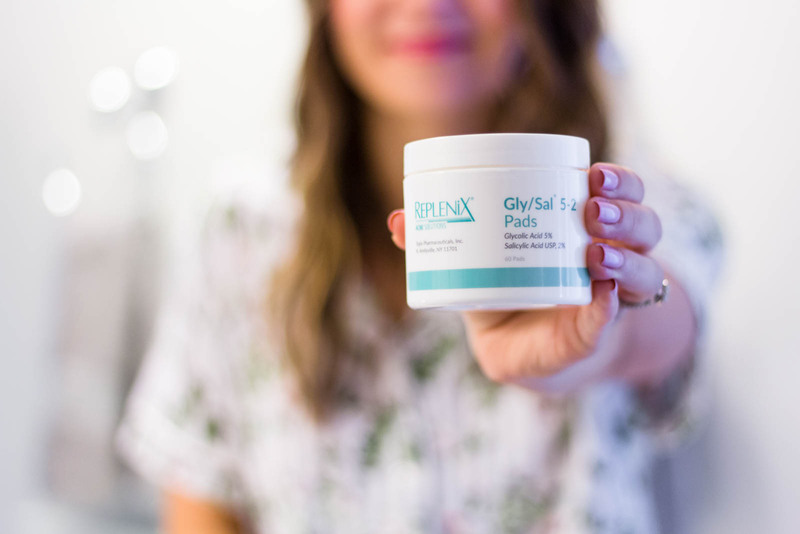 You typically start with using a retinol a few days a week because your skin has to get adjusted as it can cause some dryness and flaking- but don’t stress because we are wanting to remove that dead top layer of skin after all! I deal with melasma which is a type of hormonal hyperpigmentation and it is incredibly hard to manage. 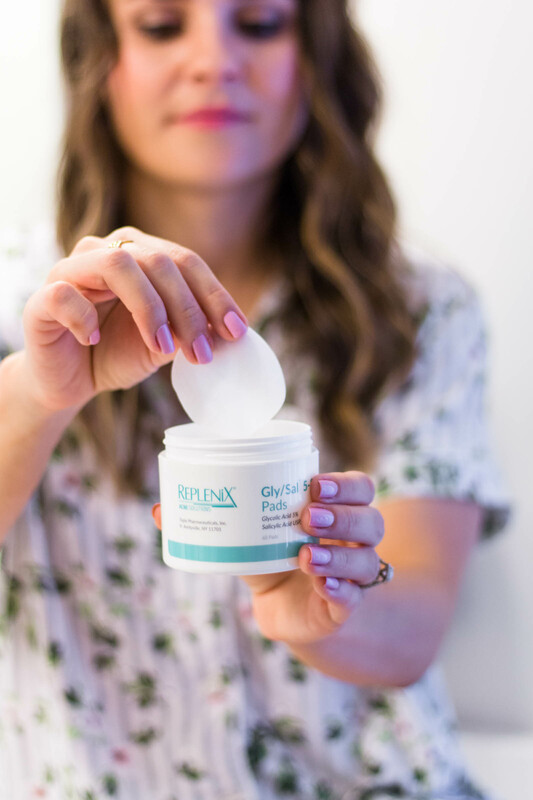 Along with wearing tons of SPF on my face, I use the gly-sal pads (a combination of glycolic and salicylic acid) to help brighten my skin and help with breakouts through chemical exfoliation. I would recommend to use these a few times a week (don’t forget the neck and chest)! They also come in a 10-2 strength which I’ve tried before but they are definitely stronger and will tingle a little so you have to let your skin adjust. I’ll admit, I’m not the most diligent about my eye cream but am trying to get better and use it most days of the week. The skin around the eyes is the thinnest on our body, which is why it can be prone to early wrinkles and crow’s feet. 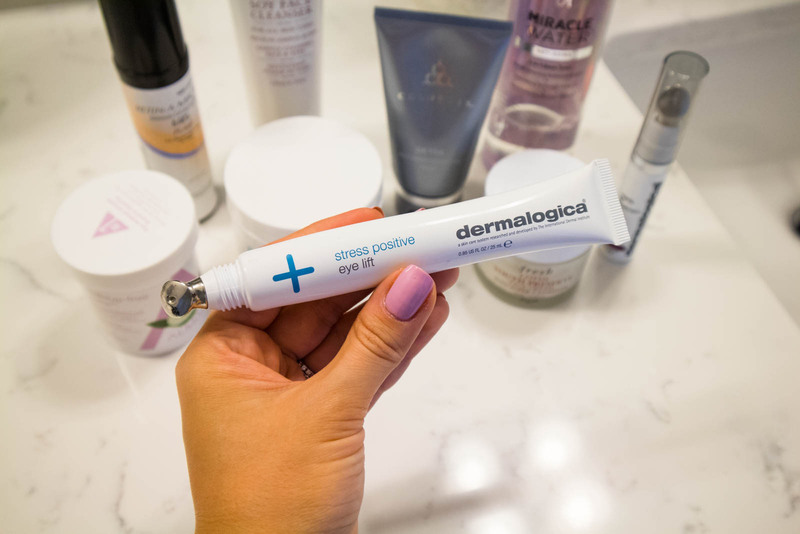 I’m a huge fan of the Dermalogica line and the stress positive eye lift cream- the cool metal applicator feels so good! Also, make sure to wear sunglasses when outside not only to prevent your skin from the rays, but to also prevent squinting which can lead to wrinkles over time. I have tried several moisturizers and have two favorites. In the summer I like to use something a little lighter, so currently it’s Fresh Lotus Youth Preserve Face Cream. In the winter when we need something thicker for hydration, I love the It Cosmetics Confidence in a Cream. Hydration is key to keeping skin plump so even on the laziest of nights, I will make sure to cleanse and moisturize if not anything else. A few nights a week I will use this Dermalogica lip treatment to hydrate and prevent fine lines. If I don’t use this, I make sure to apply Aquaphor to my lips before going to bed. I loveee trying out new face masks! I try to apply a mask about 2-3 times a week and am a huge fan of two specific ones from Cosmedix. I like the Detox activated charcoal mask to help remove impurities (I’m looking at you, clogged pores) and the Glow bamboo brightening mask to help exfoliate. I have yet to try a peel-off mask but it’s on my list! Love your night skin care routine! I love the Fresh soy cleanser-it’s amazing! Such a great routine! I’ve heard so many good things about the Fresh and Cosmedix products you use – need to pick them up ASAP! 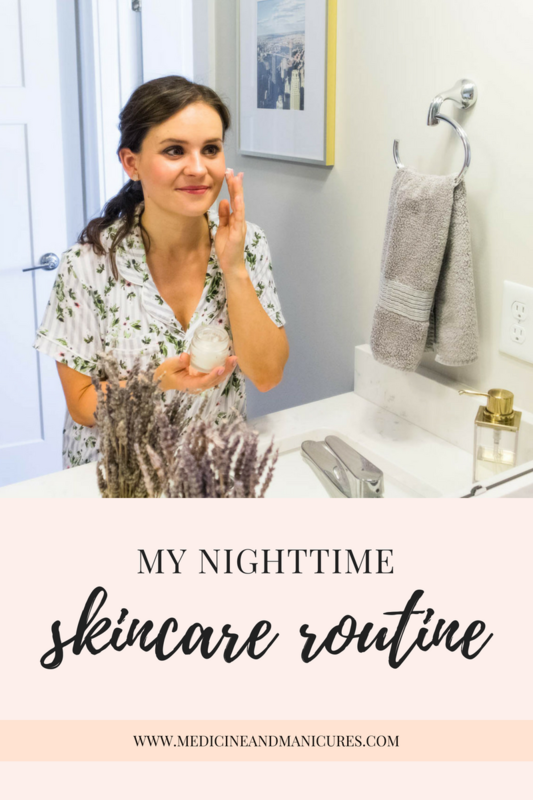 Such an awesome nighttime skincare routine!! I want to try that Dermalogica Eye Lift ! Oh I think I see a few products I need to grab soon! I always change up my night time routine when I run out of products. That eye cream sounds amazing! I use a lot of the same products! I just started using a jade roller too to help with puffiness. It’s a game changer! Love the dermalogics eye cream! Great post! Ooh i love seeing what products people use for nighttime! I need an eye cream! Fresh products are my FAVORITE! Especially their face scrub! I’ve heard such good things about the IT Cosmetics Face Water and have been wanting to try it for myself! Thanks for sharing your recommendations! I LOVE the IT Cosmetics Miracle Water… it is one of my all time favorite products! The Cosmedix charcoal mask is also a favorite… I LOVE that I can feel all the gunk getting sucked out of my pores lol!